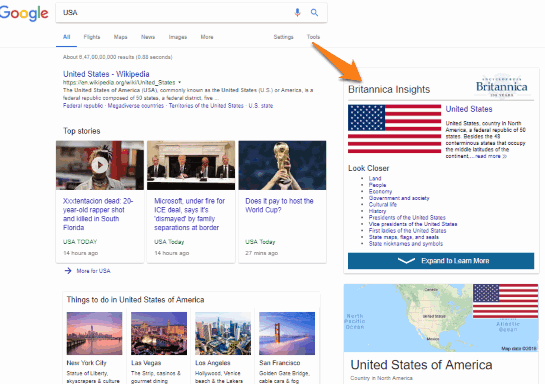 This tutorial explains how to show Britannica results in Google search result page in Chrome. Whenever you will perform some search using Google search engine in Chrome browser and there exists some Encyclopedia Britannica article related to that particular search, then Britannica result is displayed on the top right side of search result page. Whether you search for some celebrity, some place, etc., Britannica article related to that search will appear there. To show Britannica result in Google search result page in Google Chrome browser, I have covered official Chrome extension of Encyclopedia Britannica. The name of this extension is “Britannica Insights“. This extension provides a separate box where Britannica article is visible and at the bottom of that page, you can see Wikipedia article related to that search term. So, you get the benefit of both two popular encyclopedias together. In the screenshot visible above, you can see that Britannica article is visible on the top right part. And at the bottom of that article, Wikipedia article summary is visible. 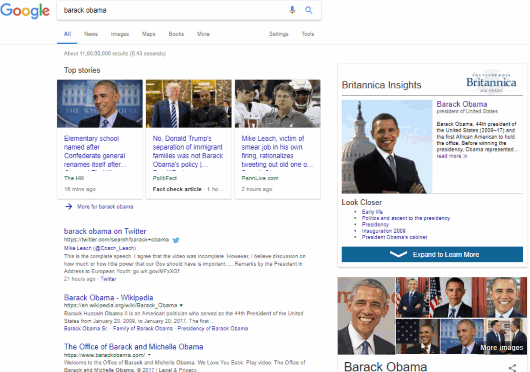 How To Show Britannica Results In Google Search Result Page In Chrome? The extension is one of the simple Chrome extensions. There is no user interaction needed to let this extension work. You just need to install the extension from Chrome Web Store. Or else, you can also access its homepage directly using the link added at the end of this review. As soon as the extension is installed, it becomes ready for you. Just open a new tab and search for something. In the search results page, if there will be some Britannica encyclopedia article available, then it will be visible on the top right part. You can use “Expand to Learn More” bar to see some more information about that article. Apart from that, you can also click on “read more” option and then it will open Britannica article page for that search term in the same tab. We have also covered some best free Wikipedia extensions for you. This is a very good Chrome extension and helpful for a lot of users. Those who want to see Britannica result in Google search result page using Chrome browser, this extension is a boon. The best part is you will continue see Wikipedia result as well. I find this extension pretty good. You should also try it.